In this paper we propose a new method for upsampling images which is capable of generating sharp edges with reduced inputresolution grid-related artifacts. The method is based on a statistical edge dependency relating certain edge features of two different resolutions, which is generically exhibited by real-world images. While other solutions assume some form of smoothness, we rely on this distinctive edge dependency as our prior knowledge in order to increase image resolution. In addition to this relation we require that intensities are conserved; the output image must be identical to the input image when downsampled to the original resolution. Altogether the method consists of solving a constrained optimization problem, attempting to impose the correct edge relation and conserve local intensities with respect to the low-resolution input image. 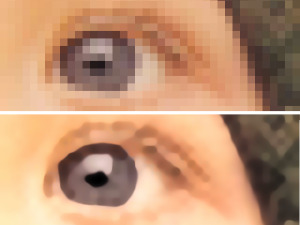 Results demonstrate the visual importance of having such edge features properly matched, and the method’s capability to produce images in which sharp edges are successfully reconstructed. Full ACM SIGGRAPH 2007 paper (Adobe PDF 1,437 KB) bibtex. A newer work on image upsampling can be found here.